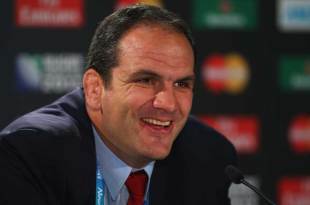 Leicester Tigers executive chairman Peter Tom has poured cold water on the suggestion of Martin Johnson returning to Welford Road. Johnson stepped down from his post as England team manager on Wednesday and with the Tigers struggling in the Aviva Premiership, the World Cup winning captain may have been open to returning to Welford Road. But Tom, who was speaking before Johnson's resignation, cannot see a role for the former Tiger at Leicester. "Martin has to decide whether he wants to stay on with England or step down," Tom told the Leicester Mercury. "If he does step down, I would expect he would want some time away from the game. And it would be difficult to see what position we would have available for him. "We have got a great director of rugby in Richard Cockerill, and I always saw Martin as more of a general manager than coach. We are also actively looking for a chief executive and have a firm conducting that search for us. "I am hoping we would have some candidates to speak to in the New Year so it is tough to see where Martin could fit in."